The nazis of the National Front/Infidels were confronted today by members of the local community who turned out in strength in St Mark’s Road to show the fascists that their hatred and violence will not be tolerated in the North East. A small number of boneheads in the north east have a bee in their bonnet regarding the building of a new mosque in the Sunderland area and are using this as a front to try and create racial tension within the local community as well as using the threat of violence if their demands aren’t met. This tactic is known as ‘terrorising’ a community until the community submits to, or backs up the demands of the minority. This is why the fascists threaten to come back again and again in the hope of wearing a community down. Racists were drafted in from as far afield as Bradford and Edinburgh to bolster numbers according to mainstream news reports. They can be seen hanging around on the grass verge in the video. 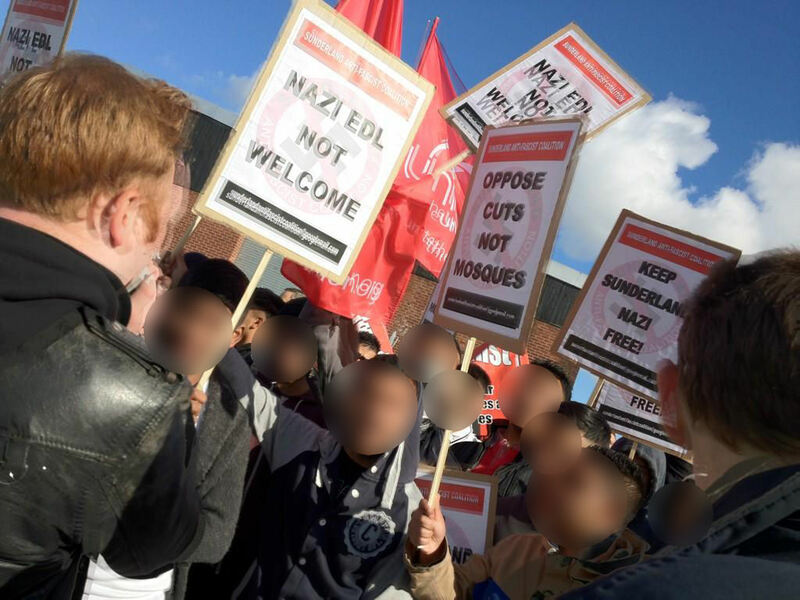 Police have charged 13 people after a demonstration at the site of a new mosque in Sunderland turned violent, as far-right groups including the EDL clashed with local Muslims and anti-fascists. Around 200 people attended the pre-planned demonstration on St Mark’s Road in Millfield on Saturday, October 6, 2012, where a former council transport depot is being converted into a mosque for up to 150 Pakistani Muslims. The English Defence League, Scottish Defence League and Sunderland Anti-Fascist Coalition were among the protesters. Police have now charged 13 people with public order offences, one person has been given a caution and one person has been issued with a fixed penalty notice. All those who have been charged are banned from attending any demonstrations in Sunderland or entering St Mark’s Road or Chester Road. Chief Superintendent Kay Blyth from Sunderland Area Command, said: “We were disappointed a protest that was planned as peaceful resulted in a minority of people involved in disorder. “This had a huge impact on local residents and since then we have been working closely with the local community and partner agencies to respond to community concerns and make people feel safer. The full list of charges is as follows: Darren Stokoe, 21, of Norman Avenue, in Sunderland, has been charged with causing fear or provocation of violence and will appear at Sunderland Magistrates Court on March 18. Anthony Farrer, 37, of Cleveland Road, Sunderland, has been charged with disorderly conduct and will appear at Sunderland Magistrates Court on March 18. Stephen Brown, 32, of Palmerston Road, Sunderland, has been charged with causing fear or provocation of violence and will appear at Sunderland Magistrates Court on March 18. Mohammed Hoque, 19, Hendon Valley Road, has been charged with causing fear or provocation of violence and will appear at Sunderland Magistrates Court on March 19. An 18-year-old male youth has been given a caution for causing fear or provocation of violence. Gary Bigger, 41, of Clarke Street in Kilmarnock, Scotland, has been charged with causing racial or religious aggravated harassment, alarm or distress and will appear at Sunderland Magistrates Court on March 18. William Smith, 44, of McLurian Crescent, Renfewshire, has been charged with causing fear or provocation of violence and will appear at Sunderland Magistrates Court on March 18. Warren Faulkener, 41, of Webb Avenue, Seaham, has been charged with causing fear or provocation of violence and possessing a controlled drug and will appear at Sunderland Magistrates Court on March 21. Shaun Bunting, 34, of Fenhall Green, Durham, has been charged with disorderly conduct and will appear at Sunderland Magistrates Court on March 18. Dean Spence, 23, of Yew Close, Spennymoor, has been charged with disorderly conduct and will appear at Sunderland Magistrates Court on March 18. Ronald Wood, 39, of Lonnen Drive, Gateshead has been charged with causing racial or religious aggravated harassment, alarm or distress and will appear at Sunderland Magistrates Court on March 18. A 17-year-old male youth has been charged with causing racial or religious aggravated harassment, alarm or distress and will appear at Sunderland Magistrates Court on March 21. Simon Biggs, 47, of Todd’s Nook, Newcastle has been charged with causing fear or provocation of violence and will appear at Sunderland Magistrates Court on March 18. Lewis Spence, 26, of Orchard View, in Durham, has been charged with causing fear or provocation of violence and will appear at Sunderland Magistrates Court on March 28. Six men have admitted causing disorder at a far-right demonstration at the site of a new mosque in Sunderland. Around 200 people attended the pre-planned demonstration on St Mark’s Road in Millfield on Saturday, October 6 2012, where a former council transport depot is being converted into a mosque for up to 150 Pakistani Muslims. 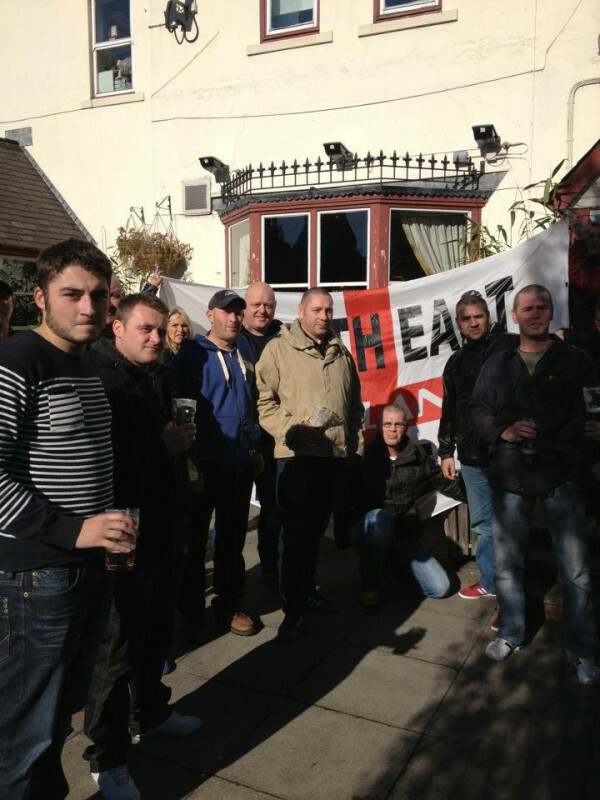 The English Defence League, Scottish Defence League and Sunderland Anti-Fascist Coalition were among the protesters. A group of Muslims and locals also attended in a counter-demo. Numerous arrests were made and 13 people in total charged with a range of public order offences. At Sunderland Magistrates’ Court on March 18 2013 six of those charged pleaded guilty to the charges. Ronald Wood, 39, of Lonnen Drive, Gateshead, admitted causing racial or religious aggravated harassment, alarm or distress, but said he was “not a racist”. He was fined £215. Shaun Bunting, 34, of Fenhall Green, County Durham, admitted disorderly conduct and was fined £238. Dean Spence, 23, of Yew Close, Spennymoor, pleaded guilty to disorderly conduct and was fined £178. Anthony Farrer, 37, of Cleveland Road, Sunderland, admitted disorderly conduct and was given a six-month discharge and ordered to pay £100 costs. Darren Stokoe, 21, of Norman Avenue, in Sunderland, admitted causing fear or provocation of violence. He will be sentenced on April 9. Stephen Brown, 32, of Palmerston Road, Sunderland, admitted causing fear or provocation of violence and that the offence was racially aggravated. He will be sentenced at a later date after the Probation Service accesses him. Warren Faulkner, who leads a splinter group of the English Defence League, will be tried by a jury after he denied causing fear or provocation of violence at Sunderland Magistrates’ Court on Thursday March 21 2013. He also pleaded not guilty to possessing cocaine, a Class A drug. The English Defence League and Scottish Defence League were among the protesters. There was a counter-demo including people from the Sunderland Anti-Fascist Coalition and a group of local Muslims. Faulkner will next appear at Sunderland Magistrates’ Court on May 16. 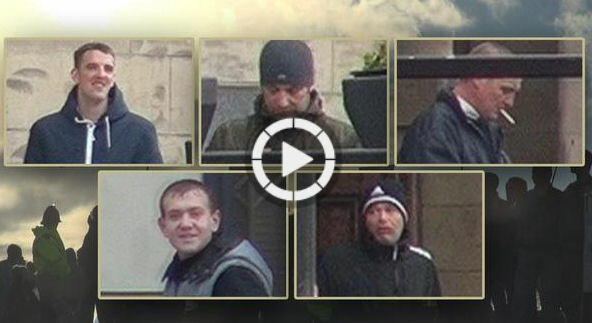 Seven people have pleaded guilty to charges relating to the disorder. AN anti-mosque protester avoided jail after he was found to be carrying cocaine following a street demonstration. Warren Faulkner also offered to “sort out” his differences with a police officer when they clashed during the protest in Millfield, Sunderland. Newcastle Crown Court was told Faulkner was among a group demonstrating about plans to build a mosque in St Marks Road. The 42-year-old, of Webb Avenue, Westlea, Seaham, was then spotted by an officer in a back lane shouting “come on, come on, bring it on”. The court heard Faulkner tried to trip up the officer, who was separating the right-wing demonstrators from the anti-fascist group. As he was being detained, Webb told the officer: “I will give you my phone number, and we can sort this out without your uniform on”. Faulkner, who had pleaded guilty at an earlier hearing to possession of a controlled substance with intent to supply, and a public order offence, claimed he was only carrying the drug after someone asked him to keep it for them. Vic Laffey, defending, said Faulkner had lost his job as a result of being brought before the court. Judge Simon Hickey QC sentenced Faulkner to six months in prison, suspended for 12 months. He also ordered him to do 100 hours’ unpaid work and abide by a supervision order. The court was told Faulkner had 22 convictions, his last back in 2002. “Make history on July 14th in Bristol. 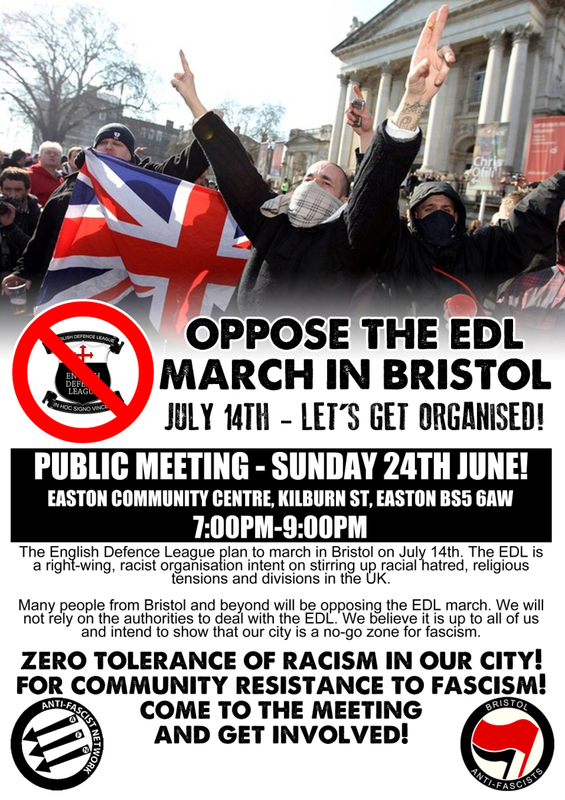 Help make the English Defence League history.